An analysis of the forces that led to Barry Goldwater’s nomination as the Republican presidential candidate of 1964. The era of Perlstein’s Goldwater is not so far from ours. The second most charismatic politician alive in the early 1960s (after John Kennedy), Goldwater was a man before his time. He was a relative outsider who knocked heads with the greats of the past (Kennedy, Johnson, Rockefeller, and Nixon), but more important were his associations with the heroes (Ronald Reagan and William Rehnquist) of more recent conservative triumphs. 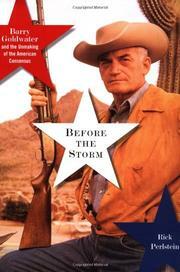 Goldwater’s crusade was against moderation, and his jeremiads convinced millions to support him. He argued that civil-rights legislation would create a police state; he felt the US should be prepared for an all-out nuclear war; he saw unions as oppressors of the working class. His rhetoric gained an audience, Perlstein argues, because of the many fractures present in the Republican Party at the time. While the Rockefeller Republicans haggled with Nixon (Perlstein describes Rocky as a “collector of chits”), Goldwater waited. He enjoyed the backing of a cadre of marginal party officials, led by expert political operatives like Clif White, who were preparing to seize the nomination. Perlstein documents every backroom meeting, every press conference, every turn of events that led to the Goldwater troops realizing that goal. The troops are what’s important here: Goldwater the man is just one aspect of Goldwater the movement. The attention to detail and the cast of characters is at times tiresome, but will be a marvelous resource for political scientists. Perlstein, who writes for the Nation clearly delights at relating Johnson's landslide defeat of the Arizona senator, yet he conveys the mindset of a Goldwater supporter with respect, asking readers to put themselves in the shoes of small businessmen bogged down by unions and the New York financial establishment. The gritty details of a chapter of American history that still resonates strongly.